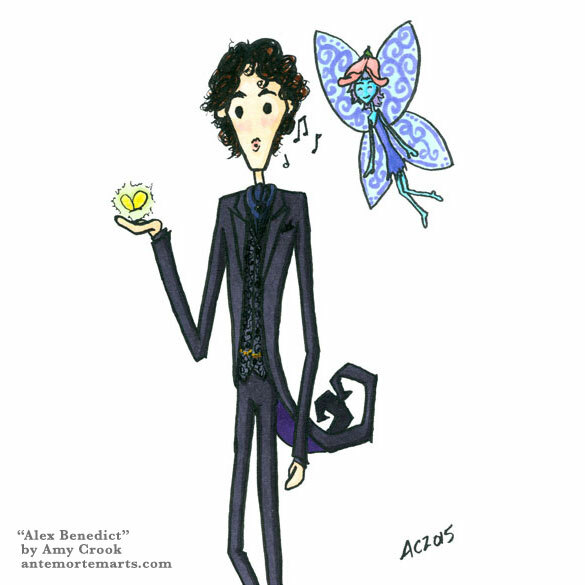 In my first self-published novel, The Courtship of Julian St. Albans, the main character Alex whistles up some magic butterflies to impress the young man he’s courting. He also manages to acquire a flower fairy, though that comes much later. At no point would he actually put up with the coattails, though he is awfully fond of black with black and a side of black as his palette. I drew this for Inktober in 2015, and colored it the other day as a warm-up to commissions. Because if I don’t do my own characters for FANbruary, who will? The third book in my Consulting Magic series is imminent! 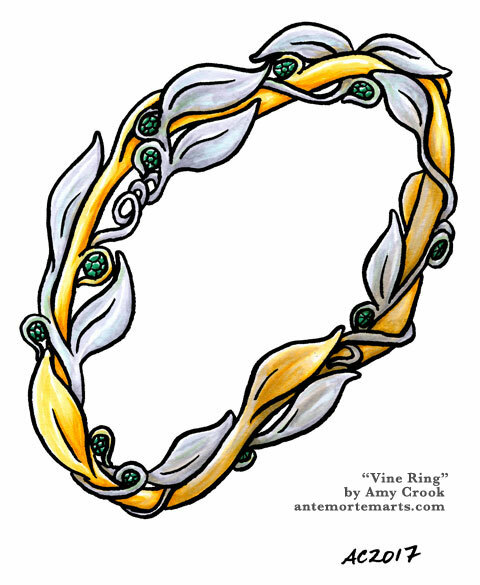 This beautiful vine ring will be part of the cover, the same way that the mechanical bird graced the first one, and magical flowers the second. 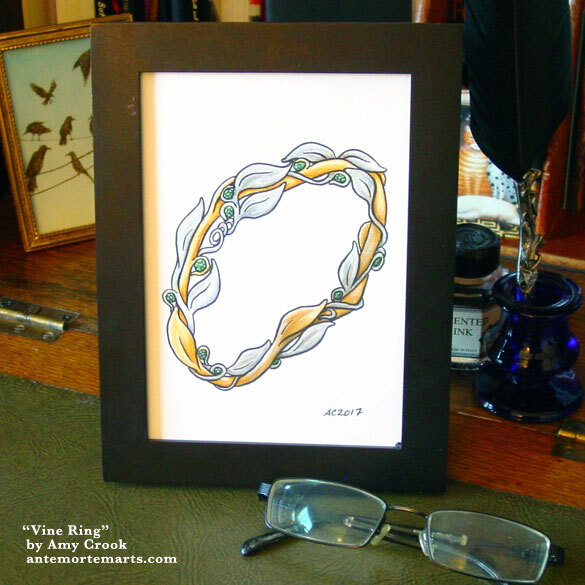 Gold and platinum vines twine around each other, thick and thin, in a graceful and organic pattern. Bright emeralds dot the design here and there, cradled in little curls of metal so their placement looks natural. It could almost be a circlet or crown rather than a ring, whatever your imagination desires. 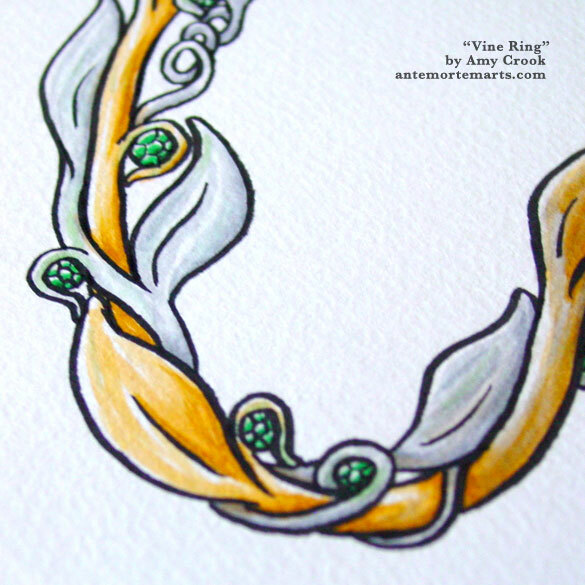 Above, you can see the tiny green emeralds shining out of the curls of metal vinework. Below, the ring sits in a frame, waiting to decorate your home. If you’ve read my novels, you probably remember Horace, the bronze sparrow created by the magical main character. He carries letters inside his hollow chest, and flies on the strength of spells written into every feather. 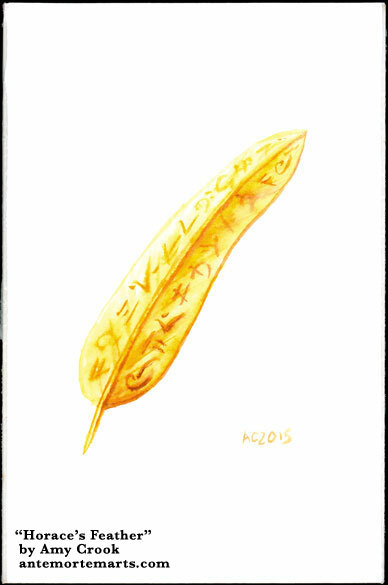 There’s just one color of ink in this bronze feather, covered in runes and imbued with magic — in the world of the book, anyway. Before you hurt your brain trying to google the runes, they’re mostly made up, and a couple of them are even stolen from my fake Cthulhu alphabet. Why make new fake runes when old fake runes will do? 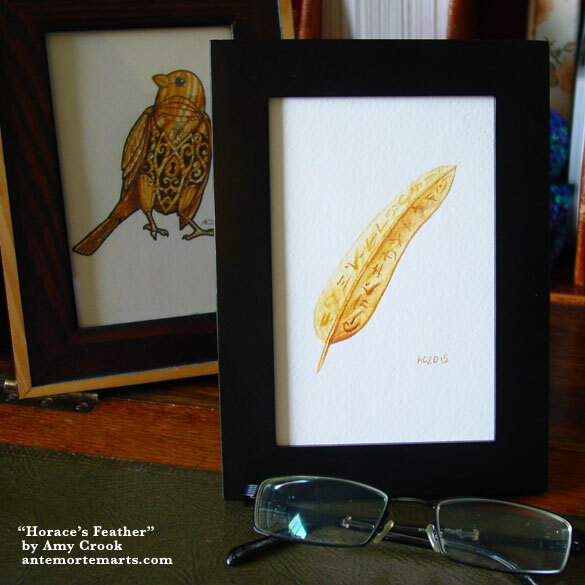 Horace’s Feather, 4″x6″ ink wash on Fluid watercolor paper. 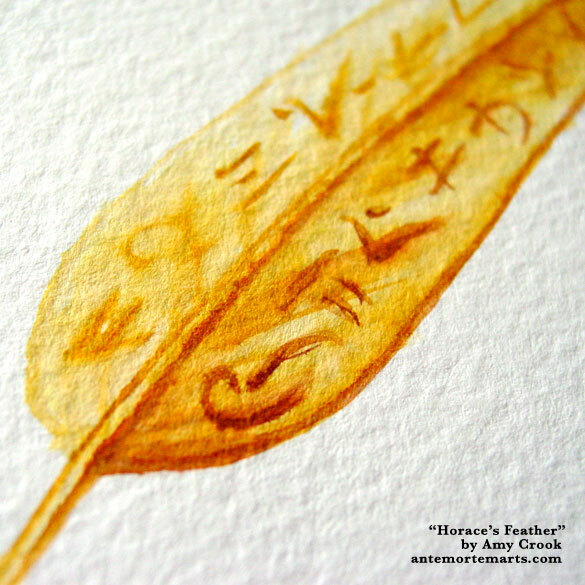 Above, you can see the ink-painted runes and bronze details of Horace’s feather. Below, it’s safely in a frame, waiting to float to a new home. Julian’s sequel is finally out! After wrestling in June & July with copy edits, and in August with weird tech problems (Createspace was finding their own cover template a tad confusing), I’ve finally published my second book! 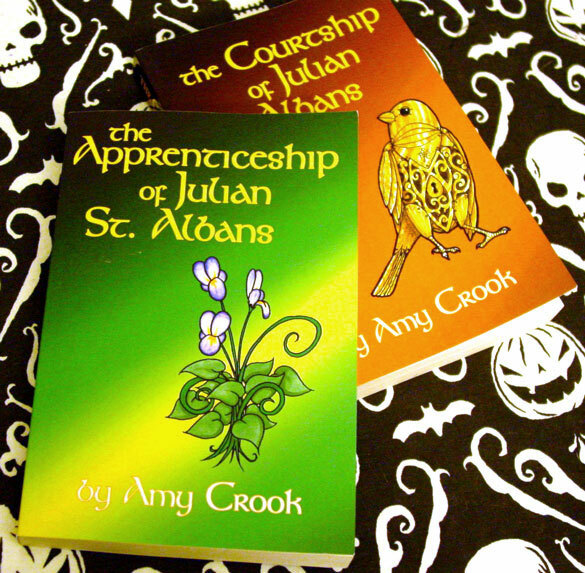 The Apprenticeship of Julian St. Albans is a sequel to my first book, where we follow Julian this time as he settles into his new life in the city with Alex. Also, there’s a Kindle Matchbook thing. If for some reason you want both versions of the book, you have to buy the physical book first. Then after you’ve paid for that order, you can go back to the ebook page and Amazon will offer you a discount. It’s cool, but tedious. Either way, it’s done it’s done it’s done omg! PS – If you haven’t read the first one yet, it’ll be free for a few days on Kindle. It’s the perfect chance! Swag for my new book release! 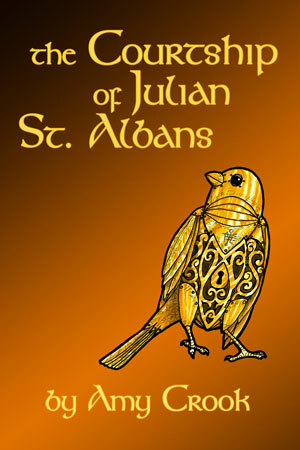 I’ve finally (omgfinally) finished the sequel to The Courtship of Julian St. Albans! Huzzah! I’ve sent off for a proof copy from Amazon, and once I’ve red-penned that for last-minute typos, the book will be ready! 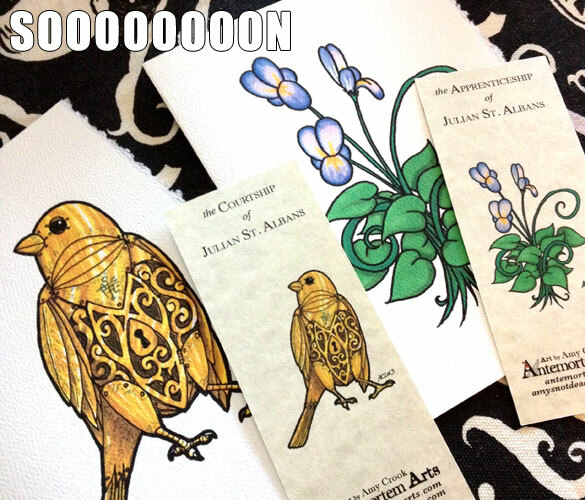 I figure mid-July, depending on the whims of the postal owls and pollen trees, but I’ve already started making up swag for a giveaway once it’s out! 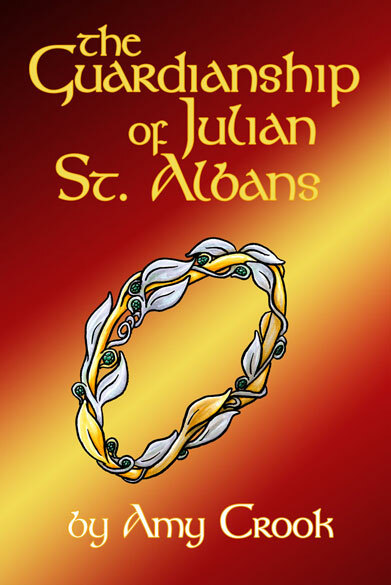 The Apprenticeship of Julian St. Albans takes us into Julian & Alex’s life almost a year after the Courtship that brought them together. Read a sample chapter here.